Congratulations to @lindseyroth and @onomatopoeia and @yugi135, the winners of drawing 2 for February 2019's Cash Shop Creature Lottery! A Luvduv has been added to each of your accounts. Today is the last day of February 2019 and is the final day that you will be able to access the Chocotravaganza Exchange Prize Shop. Be sure to spend your remaining Chocolate Boxes in the next 24 hours before you'll be locked out. Today is the last day you'll be able to purchase the Lovador from the Cash Shop Park! It goes without saying, but the Cave and Cash Shop Monthlies for February 2019 retire tonight as well. Dragold's Den returns around St. Patrick's Day this year! It'll be back and bigger than ever. Don't miss it. Stay tuned! There is a melody that comes from these books. Find them at Leila Library! Find these restocking at the Travel Agency. You will no longer be able to collect new Chocolate Boxes from feeding. You can, however, continue exchanging your Chocolate Boxes with others and continue to buy prizes from the Prize Shop through February 28. Find these Lovca cookies restocking at the Bakery today! These are all-new items for you to collect. Today is the last and final day that you can obtain Chocolate Boxes from feeding creatures. After that, you won't be able to find any new Chocolate Boxes but will still be able to exchange your remaining Chocolates with others at the HQ. The Prize Shop will also remain open through the end of this month (February 28). Thank you to everyone who has participated thus far! These Amoyrm-themed chocolates are now restocking at the Bakery. When was the last time you visited Marzi? It's time. The time has come again. These love-themed Travels are now restocking at the Travel Agency! Keep the love flowin'! UPDATE 19 FEB: The incorrect spelling "Lovrador" has been corrected to the actual species name "Lovador." Finley is restocking these new Lovador ice cream flavors. You can literally taste the love in the ice cream! Congratulations to @newlife and @foxesthebest and @roehemo, the winners of drawing 1 for February 2019's Cash Shop Creature Lottery! A Amoyrm has been added to each of your accounts. Happy Valentine's Day to all of our lovely players! Egg Cave loves you today. 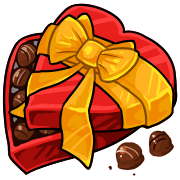 The Chocotravaganza Exchange has returned for more fun and festivities! In other words: to get the prizes you want, you have to give a little to get a little! 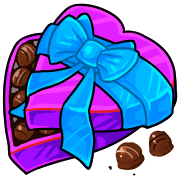 The Exchange will be open to collect Chocolate Boxes February 14-21. The Tedory is a brand-new prize as part of the Chocotravaganza Exchange this year. It is planned to be a seasonal species. Read more about it in the Archives. Many thanks to @pinkpixie and @superunloved for creating this as a creature suggestion in the Forums. The first of its kind has been added to your accounts for free. These brand-new Tedory plushies are available as prizes from the Chocotravaganza Exchange only! Find these collector's items in the Prize Shop. Like last year, February 2019's Cave Monthlies are available in the Chocotravaganza Prize Shop (limit 1). Do not take advantage of this feature from side accounts. The famous and popular Poppy Plains Travel is no longer available from the Chocotravaganza Prize Shop. The Ami has been retired from the Prize Shop this year, too. It is no longer available as part of the Chocotravaganza Exchange.